If you forgot your password, never got one from your company support, or have been locked out of your account, you can use your security info and your mobile device to reset your password. If you know your password and just want to change it, you can go to the Change your password steps in this article. If you're trying to get back into a personal account like Xbox, hotmail.com, or outlook.com, try the suggestions in the When you can't sign in to your Microsoft account article. You know your password, but your account is locked out and you need to unlock it. In the Enter password screen, select Forgot my password. In the Get back into your account screen, type your work or school User ID (for example, your email address), prove you aren't a robot by entering the characters you see on the screen, and then select Next. If your administrator hasn't turned on the ability for you to reset your own password, you'll see a Contact your administrator link instead of the Get back into your account screen. This link lets you contact your administrator about resetting your password, through either email or a web portal. Choose one of the following methods to verify your identity and change your password. Depending on how your administrator has set up your organization, you might need to go through this process a second time, adding info for a second verification step. Depending on how your administrator has set up your organization, some of these verification options might not be available. You must have previously set up your mobile device for verification using at least one of these methods. Additionally, your new password might need to meet certain strength requirements. Strong passwords typically have 8 to 16 characters, including upper and lowercase characters, at least one number, and at least one special character. Reset your password using an email address. Sends an email to the email address you previously set up in two-step verification or security info. If your administrator has turned on the security info experience, you can find more info about setting up an email address in the Set up security info to use email (preview) article. If you're not yet using security info, you can find more info about setting up an email address in the Set up my account for two-step verification article. Select Email my alternate email, and then select Email. Type the verification code from the email into the box, and then select Next. Type and confirm your new password, and then select Finish. Reset your password using a text message. Sends a text message to the phone number you previously set up in security info. If your administrator has turned on the security info experience, you can find more info about setting up text messaging in the Set up security info to use text messaging (preview) article. If you're not yet using security info, you can find more info about setting up text messaging in the Set up my account for two-step verification article. Select Text my mobile phone, type your phone number, and then select Text. Type the verification code from the text message into the box, and then select Next. Reset your password using a phone number. Sends a text message to the phone number you previously set up in security info. If your administrator has turned on the security info experience, you can find more info about setting up a phone number in the Set up security info to use a phone call (preview) article. If you're not yet using security info, you can find more info about setting up a phone number in the Set up my account for two-step verification article. Select Call my mobile phone, type your phone number, and then select Call. Answer the phone call and follow the instructions to verify your identity, and then select Next. Reset your password using security questions. Shows you the list of security questions you set up in security info. If your administrator has turned on the security info experience, you can find more info about setting up your security questions in the Set up security info to use pre-defined security questions (preview) article. If you're not yet using security info, you can find more info about setting up security questions in the Set up my account for two-step verification article. Select Answer my security questions, answer the questions, and then select Next. Reset your password using a notification from your authenticator app. Sends an approval notification to the authenticator app. If your administrator has turned on the security info experience, you can find more info about setting up an authenticator app to send a notification in the Set up security info to use an authentication app (preview) article. If you're not yet using security info, you can find more info about setting up an authenticator app to send a notification in the Set up my account for two-step verification article. Select Approve a notification on my authenticator app, and then select Send Notification. Approve the sign-in from your authenticator app. Reset your password using a code from your authenticator app. Accepts a random code provided by your authentication app. If your administrator has turned on the security info experience, you can find more info about setting up an authenticator app to provide a code in the Set up security info to use an authentication app (preview) article. If you're not yet using security info, you can find more info about setting up an authenticator app to provide a code in the Set up my account for two-step verification article. Select Enter a code from my authenticator app, and then select Send Notification. Open your authenticator app, type the verification code for your account into the box, and then select Next. After you get the message saying that your password has been reset, you can sign in to your account using your new password. If you still can't access your account, you should contact your organization's administrator for more help. After resetting your password, you might get a confirmation email that comes from an account like, "Microsoft on behalf of <your_organization>." If you get a similar email, but you didn't recently reset your password, you must contact your organization's administrator immediately. If you just want to change your password, you can do it through the Office 365 portal, the Azure Access Panel, or the Windows 10 sign-in page. 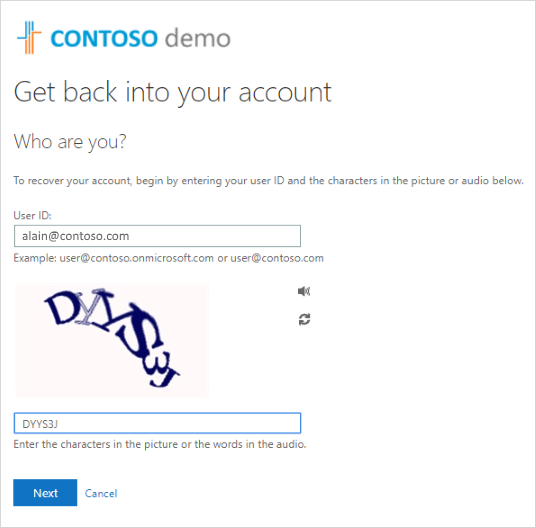 Sign in to your Office 365 account, using your existing password. Select your profile on the upper-right side, and then select View account. Select Security & privacy > Password. Type your old password, create and confirm your new password, and then select Submit. Sign in to the Azure Access Panel, using your existing password. Select your profile on the upper-right side, and then select Profile. If your administrator turned on the functionality, you can see a link to Reset password on your Windows 7, Windows 8, Windows 8.1, or Windows 10 sign-in screen. Select the Reset password link to start the password reset process without having to use the normal web-based experience. Confirm your user ID and select Next. Select and confirm a contact method for verification. If necessary, choose a second verification option that's different from your previous one, filling in the necessary info. On the Create a new password page, type and confirm your new password, and then select Next. Strong passwords typically have 8 to 16 characters, including upper and lowercase characters, at least one number, and at least one special character. After you get the message saying that your password has been reset, you can select Finish. When I try to change my password, I get an error. Your password has a word, phrase, or pattern that makes your password easily guessable. Try again using a stronger password. After I enter my User ID, I go to a page that says, "Please contact your administrator." Microsoft has determined that your user account password is managed by your administrator in an on-premises environment. As a result, you can't reset your password from the "Can't access your account" link. Contact your administrator for more help. After I enter my User ID, I get an error that says, "Your account is not enabled for password reset." Your administrator hasn't set up your account so you can reset your own password. Your administrator hasn't turned on password reset for your organization from the "Can't access your account" link, or hasn't licensed you to use the feature. To reset your password, you must select the "contact an administrator link" to send an email to your company's administrator, and let them know you want to reset your password. After I enter my User ID, I get an error that says, "We couldn't verify your account." The sign-in process was unable to verify your account info. There are two reasons you could be seeing this message. 1. Your administrator turned on password reset for your organization, but you haven't registered to use the service. To register for password reset, see one of the following articles, based on your verification method: Set up security info to use an authenticator app (preview), Set up security info to use a phone call (preview), Set up security info to use text messaging (preview), Set up security info to use email (preview), or Set up security info to use security questions (preview). 2. Your administrator hasn't turned on password reset for your organization. In this situation, you must select the "contact an administrator link" to send an email to your administrator, asking to reset your password. Learn about security info in the Security info (preview) overview article. 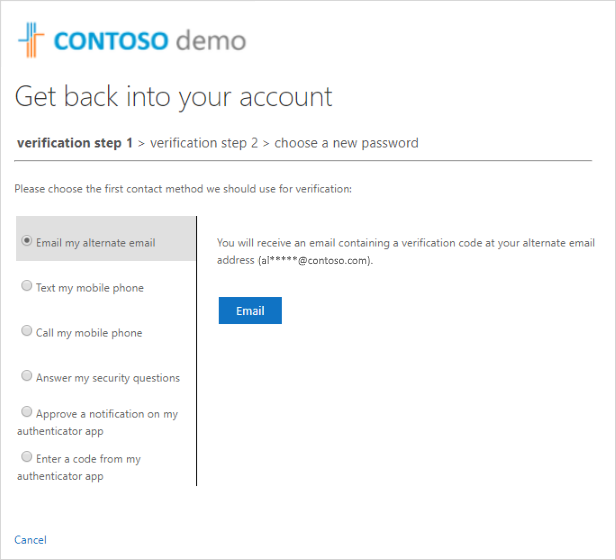 Learn about two-step verification in the Two-step verification overview article. Get troubleshooting tips and help for sign-in problems in the Can't sign in to your Microsoft account article.